More often than I like, when I look around me, or hear the occasional news that breaks through my voluntary media fast, or in some other way come in contact with the world at large, my response to what I notice and observe is one of grief. This past week, three different pieces of news caught my fancy and brought a smile to my face. Then I saw a connecting link, and that’s when I decided to write about them here. For anyone who believes that Occupy is dead (I sort of did myself, with quite a bit of sadness), I urge you to learn about one of its latest incarnations. In the wake of Hurricane Sandy, a massive grassroots effort in New York City that’s come to be known as Occupy Sandy emerged from the movement in order to support people who’ve been hit by the hurricane, especially in low-income areas. Rather than duplicating information that’s widely available elsewhere on the Internet, such as this on HuffPo, I want, instead, to highlight some of what’s been most striking for me about this initiative. First and foremost, just like a spontaneous mobilization on the day of Sep 11, 2001 that’s been little known (BOATLIFT, An Untold Tale of 9/11 Resilience), Occupy Sandy proves beyond a shred of doubt that citizen-led efforts, without government or corporate intervention or coordination, are more than adequate to address conditions of extreme need, given the right conditions. Such efforts, as I see it, work best when people are mobilized in response to a clear need that immediately speaks to their human heart, and when none of the usual fears and mistrust interfere with that goodwill. We all know that such conditions are most prevalent in the wake of emergencies. As a person of a particular kind of faith in the human spirit, the question for me has always been: what can we do to replicate such extraordinary successes and make them ordinary, the new normal? In this situation, the success doesn’t end simply with the support being coordinated and given to those in need. One of the most exciting aspects of this story for me is the fact that the efficiency and competence of Occupy Sandy’s efforts have been so much more successful than the Red Cross’, that there is now a de-facto collaboration between Occupy and the local government. My heart delights at this possibility of setting aside former or even possibly current enmity and working together on a task of alleviating suffering. What else is possible? What can be done to increase, deepen, and broaden this kind of collaboration? Some statements, even those I consider to be an expression of wisdom, are so often heard, that it’s hard to even think what they mean in practical terms. One such statement is the idea that “problems cannot be solved by the same level of thinking that created them” (which is attributed to Einstein, apparently incorrectly, a point to which I shall return below). If I had any doubt about the wisdom of this notion, I now have a clear example of how this operates. The direction for solution that I learned about: mobilizing masses to buy and forgive debt. The idea is dramatically simple, and it’s called Rolling Jubilee. This group solicits donations, large and small, and then uses the funds to buy debts from those who “own” them – a practice favored by many corporate entities, with the going rate being as low as 5 cents on the dollar – and then to forgive them instead of collecting them – a novel idea at whose inception I wish I were present. I love human ingenuity. I am inspired by people coming together to alter the course of events beyond the power of any one of them to change. And I appreciate the willingness of so many of us to support these efforts on behalf of people we will never know. Because debts are bought and sold in blocks, it is anonymous people who will benefit from this new practice. It will continue to be anonymous people until and unless this initiative catches enough fire that millions of US citizens or others all contribute and all debts are forgiven. Rolling Jubilee is, still, a drop in a bucket in terms of altering the power games. I am so enamored by it because of the potential, which is only beginning to unfold. In this particular case, after reviewing what I read about the Rolling Jubilee, and giving it some thought, I tend to agree with Lynda. I know I want to live in a world where debt has been eliminated. Even the ancient Hebrews saw the disastrous consequences of debts, which is why they instituted the laws of debt relief and jubilee (from the Hebrew word “yovel”). Seeing the creative genius of this group of people, another indirect offshoot of Occupy, I have ever so slightly more hope that we can find ways into a more collaborative and responsive future. 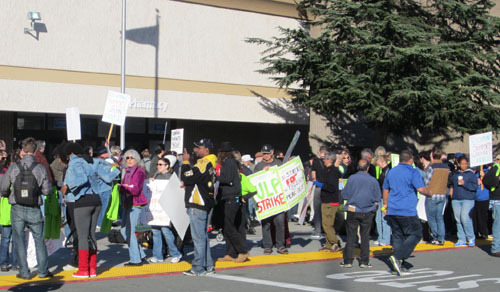 My third story of inspiration from this week is the rolling strike undertaken last week by employees of Walmart, on the biggest shopping day of the year in the US. Knowing that people read my blog all over the world, here’s a small bit of background for those who may not be aware. Every year hundreds of millions of people in the US celebrate Thanksgiving on the 4th Thursday of every November, and many of them go shopping the next day. It’s called Black Friday, because for many retail stores, it’s the day that their financial reports turn from red to black. Walmart is the biggest private employer in the world, and its third largest corporation. Last Friday, despite the strike, Walmart sold 1,300,000 televisions on that morning alone. Walmart is famous for two things in particular: its prices are considered to be extremely low, which is what attracts the customers, and its labor practices are considered to be extremely exploitative, which many justify by pointing to the low prices. 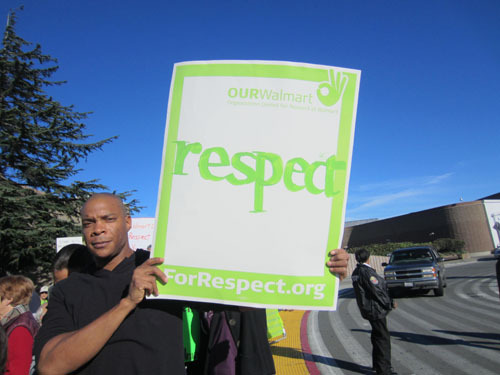 Since this blog post is dedicated to news that inspired me, I won’t dwell on what I know about Walmart’s labor practices, available for anyone to read about abundantly on the Internet. I do want to mention one aspect of those practices that is relevant to my immediate focus: Walmart has been accused, repeatedly, of retaliating against workers who try to organize or who speak up. The timing of the strike was chosen very deliberately for maximum effect precisely because it’s the biggest shopping day of the year. The strikers were hoping to make a dent in company profits by discouraging people from shopping. As far as I can tell from my own observations when visiting the event outside the Richmond, CA store, (where I took the photos above and someone snapped me below holding the banner) combined with what I have been able to glean from the Internet, this goal has not been achieved. Shoppers, many of whom were also workers in retail stores, expressed their support before or after shopping, not instead of. Another challenge the organizers faced was the very issue about which they are striking: many employees chose to stay on the job for fear of retaliation. Even the coming together of so many was not enough for many more. 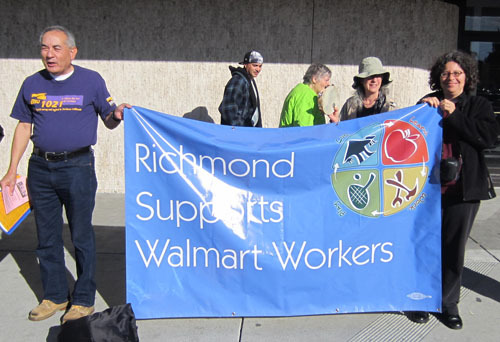 My own inspiration and uplift in response to this strike is based on the very fact of it happening, and especially on the fact of Walmart workers having created an organization of their own called OURWalmart. I was so delighted to see people willing to take so much risk for what matters to them, to come together with others to gain strength, and to use creative strategies. Some of the organizers have clearly expressed that this was not a one-time campaign, as protests and smaller strikes have already taken place earlier this year. I imagine that even as I am writing this, some of the organizers are studying the results of this strike, looking for patterns of response, figuring out what they and others can do to reach the workers who are too afraid to risk or too hardened to hope. There’s no doubt in my mind that the long-term success of Walmart’s employees, and our overall future, both depend on finding ways to break out of the individualized life habit that’s been the norm in this country and is spreading around the globe together with consumption and global capitalism. How much togetherness has anyone experienced in this campaign, and what would it take to provide people with a visceral sense of it to want it? Often in evolutionary processes a species must adapt to new conditions in order to survive. Today the atomic bomb has altered profoundly the nature of the world as we knew it, and the human race consequently finds itself in a new habitat to which it must adapt its thinking. … Today we must abandon competition and secure cooperation. This must be the central fact in all our considerations of international affairs; otherwise we face certain disaster. One thread connecting all three parts of what I learned about this past week is the move towards collaboration, towards working with others in pursuit of solutions to seemingly intractable problems. Just as much as we moved from pre-determined coercive structures and life, the mainstay of medieval Europe, into competition-based societies, so we can move, in response to the urgent needs of our times, into collaborative and cooperative functioning. It’s already happening, and this is what gives me hope. The enormous pressures on all of us to continue to operate as small, insignificant individual consumers primarily preoccupied with finding the lowest prices for what we want to buy and protecting ourselves from individual collapse are not insurmountable. People, in these stories and elsewhere, every day, join forces and make things happen. May we all take noticeable steps towards each other, despite the attendant discomfort, until we are able to co-create the world of our dreams. I had not heard about Rolling Jubilee, and I'm glad you brought it up here. The ingenuity is breathtaking. It reminds me somehow of other "people's movements" that have inspired me over the years (I keep going back to the people's revolution that overthrew Marcos in the Philippines). Love these examples for inspiration and bolstering trust that all kinds of creative possibilities can emerge when the will and awareness is there. Examples of bold requests that people are making that are changing the world!